The Aurora Borealis? At that time of year? At that time of day? In this part of the country? Localised entirely on North Tce? Nathan wrote: The Aurora Borealis? At that time of year? At that time of day? In this part of the country? Localised entirely on North Tce? That is the power of the Fringe. Despite the fact they are obviously grilled. Nathan & Norman wrote: Tenuous connections to pop culture reference. You know I love you guys? Right? And here it is! 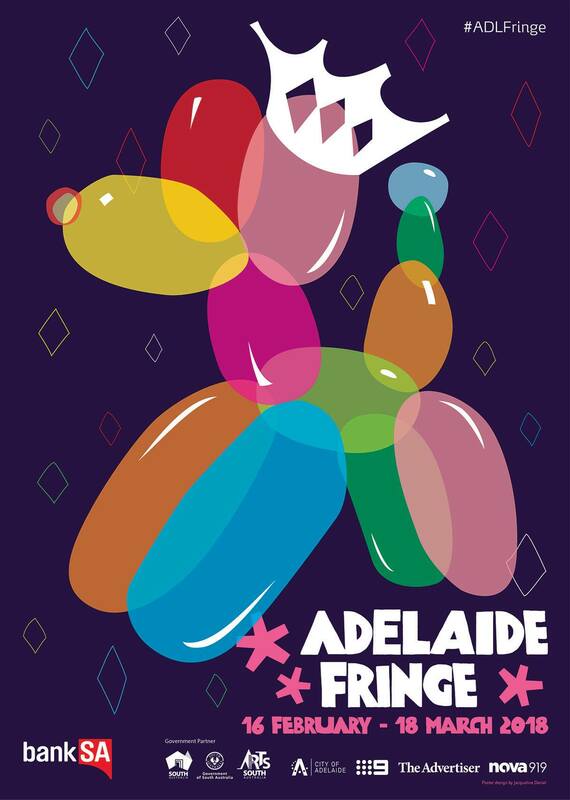 Our winning poster for the 2018 Adelaide Fringe entitled 'Unleash the Night' by Sydney-based artist Jacqueline Daniel- congratulations to Jacqueline on her wonderful design and a huge thank you to everyone who shared their amazing artwork with us for the competition this year! Guaranteed to bring happiness & joy to our 'Tax-and-Unemployment Encumbered' Festival State! PREMIER Jay Weatherill is backing a bid by Adelaide Fringe venue the Royal Croquet Club for a long-term event lease in the Parklands. Mr Weatherill, Bank SA chairman Peter Hanlon and Arts SA executive director Peter Louca have written to Adelaide City Council in support of an application by RCC for exclusive rights to its Pinky Flat Fringe hub for a five years. The council will hold what is expected to be a confidential emergency meeting on Tuesday to consider the application which comes just weeks after the RCC directors Stuart Duckworth and Tom Skipper secured last-minute approval to stage the event at this year’s Fringe. The Advertiser understands that the RCC’s bid for a long-term lease is being backed by a successful South Australian businessman who has made his fortune in hospitality. In a January 15 letter, addressed to Lord Mayor Martin Haese and sighted by The Advertiser, Mr Weatherill said as Arts Minister he supported the RCC being granted a “multi-year” licence. “The activation of Pinky Flat site contributes greatly to the vibrancy and entertainment options available across the city during our peak festival period,” he wrote. Mr Hanlon wrote the RCC adds to the “rich fabric” of the city and its “international renown”. “Having previously been a senior executive with the Westpac Banking Corporation, I’m well aware of the role certainty plays in any financial enterprise,” he wrote in a January 15 letter. Mr Louca, who also wrote a January 15 letter to the council, said a long-term lease would provide greater stability for planning, artistic programming and venue development. But Councillor Anne Moran said she would want to see some “really solid financials” to be convinced of approving a long-term lease. “They are going to have to really pull a rabbit out of a hat for me,” she said. Councillor Alex Antic said given the RCC’s financial problems he was concerned about issuing them a lease longer than a year. “My concern is making sure ratepayers are protected from ongoing liabilities,” he said. The council on January 5 approved RCC’s licence for this year’s Fringe event after directors Stuart Duckworth and Tom Skipper met a third and final deadline to provide financial security to cover post-event remediation of the Pinky Flat site. The RCC was placed in voluntary administration last June but creditors voted in September to approve a Deed of Company Arrangement to allow them to keep trading. Why does Anne Moran or anyone else in the council need to see "strong financials" of someone leasing a miniscule section of the parklands for a pop up venue over a couple of weeks of the year? Do they ask to see "strong financials" of the food truck vendors they allow at various venues? Do they ask to see "strong financials" of a Chinese building company before they approve an apartment tower? Surely, if RCC lease the site for 5 years, and then fold...it can then be re-let to someone else to put in a pop up venue at that time. The council are against it, that's why they'll throw up any excuse and as many walls to try and stop it, without being seen to actually say we don't want this. The sooner the council is abolished the better. Any comments on the fringe events so far ? The Fringe Festival is in full swing. Great vibe around the city! We have booked into seven shows across the city and suburbs, including Angas Street (Royalty Theatre), the German Club, Gluttony and the Garden of Unearthly Delights. The city was buzzing last night and public transport was well utilised, in and out of the city. We had to collect some tickets early in the evening at the Fringe Box Office in Gluttony. The queue for ticket collection was quite long but it didn’t take long. Just swipe your (Visa) card, used for purchase, and the machine prints out any outstanding tickets. We wandered down Rundle St East, totally packed with diners with extra tables for alfresco dining on footpaths and the (closed) roadway, and Fringe street artists entertaining the hordes. I really liked the look of the dancing disco (Guru Dudu) walking tour group having fun while disco dancing down Rundle St. (Silent but with flashy headphones). They added to the energy and party atmosphere of the street. After a delicious burger meal at Burger Theory, we headed off along Frome St to the German Club for an entertaining show with The Brewster Brothers playing Dylan. Along the way, the music was pumping, coloured lights aplenty, at the City Beach. Not sure what was on there but it brightened up the vicinity! Last week, we went to a show in Norwood Parade to support local artists and to the Sunday Comedy Gala (and Gouger St). We liked the Kiwi comedian, James Nokise, so we added another show (Talk a Big Game) to our list. The two theatres in Angas St bring many Fringe goers of all ages to this precinct, but it’s sad to see Victoria Square so underutilised (Thanks ACC). The Grounded (family-friendly?) pop up precinct has already closed its season. I can’t report on the Royal Croquet Club at Pinky Flat or Parade of Lights projections along North Terrace. Hopefully, someone else can. Next week it’s off to GOUD and Gluttony. The RCC is now in its 5th Year! I was so mesmerized by the Parade of Light! Next year, there might be something special to mark Channel 9 Adelaide's 60-Year Anniversary!